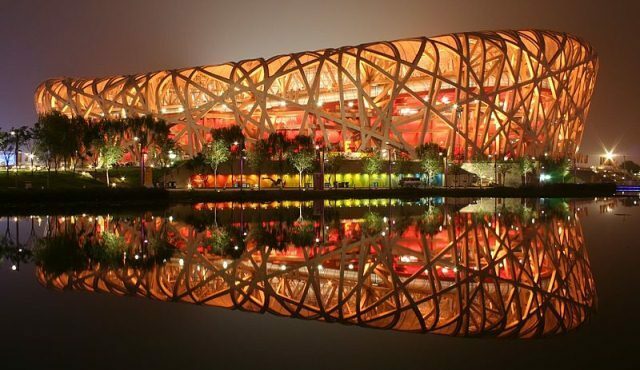 The team behind one of the most celebrated Olympic stadia in history, the Bird's Nest at the Beijing Games in 2008, will reunite to build this year's Serpentine Pavilion. The architects Herzog and de Meuron will reunite with artist Ai Weiwei, who has come under increasingly harsh scrutiny from the Chinese authorities. He was imprisoned in his homeland last year over "economic crimes", which sparked a message of protest at Tate Modern, where he had previously filled the Turbine Hall with sunflower seeds in 2010. In a neat bit of serendipity, the Tate Modern's redevelopment, and the new extension, were designed by Herzog and de Meuron. The old foundations form a jumble of convoluted lines, like a sewing pattern. A distinctive landscape emerges out of the reconstructed foundations which is unlike anything we could have invented; its form and shape is actually a serendipitous gift. Traditionally the Serpentive Pavilion is designed by an architecture who has not built in the UK before, which clearly doesn't apply to Herzog & de Meuron. However, the gallery has eschewed that pitfall by stating that it is the team's first "collaborative structure" in Britain. A flimsy rationale, perhaps, but one that Londoners should benefit from. The pavilion will open in June.